Sunsets and pre parties galore, Mambo is the biggest player on the strip. Once just a small Ibizan house, Café Mambo was soon transformed into one of the most iconic restaurants and bars on San Antonio's famous sunset strip. 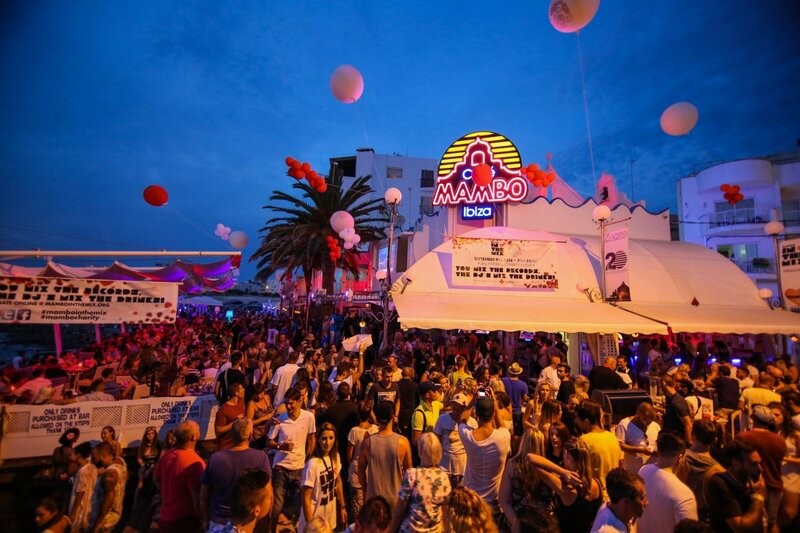 As the brainchild of Javier Anadon, Café Mambo was launched in 1994 and has since thrived and expanded to become one of the most talked about places in San Antonio and Ibiza alike. Providing the sunset strip with a venue that not only serves up delicious food to the backdrop of one of the worlds most mesmerising sunset spots but also a place for tourists and locals to enjoy music from globally renowned DJs. Throughout the week the DJ booth – which is intimately tucked away behind tables that overlook the main promenade, is taken over by Pacha's finest for their pre-parties. An average week may see the likes of Solomun, Guy Gerber, Martin Solveig and Bob Sinclar take to the decks; and of course with this comes an unrivalled atmosphere which paired with the scenery takes you on a journey to paradise. Café Mambo has also been awarded the DJ Award for 'The Best Bar in Ibiza' several times which stands as a solid recognition to its contribution to the island's nightlife and in particular the transformation of San Antonio. While the venue offers holidaymakers a taste of the bustling music scene and allows you to experience an elite experience each evening, it still remains authentic and embraces the charm of the White Isle with its décor of mosaics, marble and white furniture. Open throughout the day, Café Mambo not only offers great nighttime entertainment but it also makes the perfect pit-stop for an afternoon stroll. You can grab a delicious strawberry daiquiri and nibbles while sitting on the terrace that overlooks the famous rocky area and Mediterranean sea. As day goes into night the crowds filters in filling the surroundings and creating an amazing atmosphere. Then the plasma screen drops down to showcase the DJ talent to the masses and the infectious house sounds fill the air as the sun sets across the horizon. If you want to have dinner at Mambo we strongly recommend to reserve a table, especially if it's around sunset time which obviously is the daily peak at Café Mambo and the sunset strip generally. Café Mambo also prides itself on being a family business, having had the same management for over 20 years. As a truly magical place, Café Mambo has become more than just a restaurant in one of Ibiza's resorts; it has become part of the island's history and a firm staple in the nightlife of San Antonio. Listen to all the latest sounds straight out of Café Mambo in this Spotify playlist. Listen below and head here to subscribe.